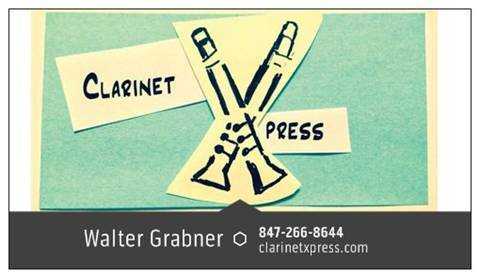 Below you can order Walter Grabner clarinet mouthpieces with a click of a button. The appropriate shipping charges will be calculated when you go through the check out process, whether or not you are US based or International. Please – no more than three bass clarinet mouthpieces per order. CXZ_BH “Lawrie Bloom” Basset Horn Mthp $325 U.S.
CXZ_BH “Lawrie Bloom” Basset Horn Mthp with Rovner 2RS Ligature and Cap $350 U.S.
CXZ_LB “Lawrie Bloom” Bass Clarinet Mouthpiece $400 U.S.
CXZ_LB “Lawrie Bloom” Bass Clarinet Mthp with Rovner 3RL Ligature and Cap $425 U.S.
CX_BB_PERS Bass Clarinet Mthp with Rovner 3RL Ligature and Cap N/A U.S.
CX_BB_90 Bass Clarinet Mthp $350 U.S.
CX_BB_90 Bass Clarinet Mthp with Rovner 3RL Ligature and Cap - $375 U.S.
CX_EBCN Contra Alto Clarinet Mthp $400 U.S.
CX_EBCN Contra Alto Clarinet Mthp with Rovner 4RS Ligature and Cap $425 U.S.
CX_BBCN Contra Bass Clarinet Mthp $400 U.S.
CX_BBCN Contra Bass Clarinet Mthp with Rovner 4RL Ligature and Cap $425 U.S.